Jason was glum about his departed dog. Not only was Koda a good guard dog, he had been a good companion (when he was around). Sunshine, our Golden Retriever, is a great companion, but as a guard dog, she's a bit cowardly. We think it's because she has some eyesight issues and doesn't see well in the dark. After we were certain that Koda was gone for good, Jason started looking for another dog. With bears as next-door-neighbours, having two dogs isn't a bad idea in the Peace Country, even if they are both good guard dogs. Jason did all kinds of research on what breed would be the best fit for our current situation. As much as I didn't want to start with a puppy, I knew from experience that we were likely to get a better dog in the end if we did so. You can get great dogs from rescues, and we have had several, but you have to be willing to invest a lot of time to get them there--which we don't have right now. We found a breeder by Edson who had a six-month-old pure-white Alaskan Malamute male for sale at a price we could afford--there was nothing wrong with him, he just hadn't sold when the rest of his litter-mates had. The owner had lowered the price to try and recoup the cost of dog feed, and not have to keep feeding him! He had more puppies on the way, after all. Thunder at 6 1/2 months. It wasn't long, though, before Thunder acquired a few nicknames, "Big Galoot" and "Destructo-Beast" being the most common. Only weeks after Thunder had joined the homestead, Noah went out to feed the chickens and gather eggs. The run door wasn't latching properly, needing some adjustment after the winter. In about five minutes, Thunder managed to kill one of my two roosters and fifteen of my eighteen laying hens. A couple weeks later, he got one more hen through a similar circumstance. I wasn't happy, needless to say. Mostly with Noah's carelessness. However, I must be becoming calloused, because it was not as devastating as it once would have been. Things like this are just part of having puppies, and kids, and chickens. (Sigh.) He wasn't after blood, anyway--he just wanted to play. As soon as a dog that size starts playing with a chicken, though, it "breaks." Then he had to go on to the next wonderfully-jumpy feathery squawking ball, but I'm sure it broke disappointingly early, too. Other than the normal puppyish predicaments, Thunder has been a joy. He has proven to be just as sweet-tempered as Koda was, just as eager to please, although much, much bigger. 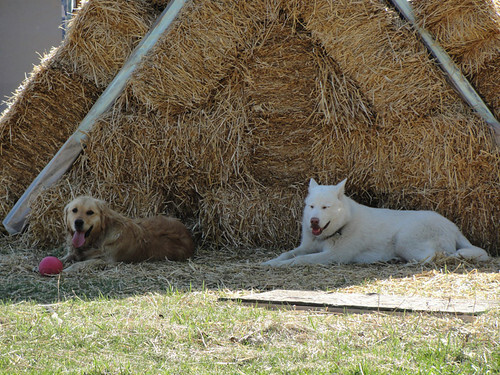 For Sunshine's part, although she and Koda had an on-again, off-again relationship, she and Thunder bonded right away. There was no struggle for dominance, probably due in part to the fact that Thunder was already bigger than her when we got him. He just got to be top dog from the start--something that she was never quite willing to let Koda be. Also, I think she was pretty lonely after nearly a winter without a buddy. It took a few weeks, but Thunder even managed to teach Sunshine how to play. Now they wrestle with glee and abandon on a regular basis. Taking a break in the shade of the coop after a wrestling match, Mother's Day. Thunder didn't just earn the name "DestructoBeast" because of the chicken incident, though. Like most puppies, he likes to chew. His texture of choice is plastic. Unfortunately for him, and for me, many of my started and potted plants are in plastic pots, conveniently near the front door. It wasn't long before his chain was shortened so he couldn't reach them when tied. And we keep a pretty close eye on him when he's not! We've also had to remove the plastic knobs from the barbecue. Once in a while, he tries to get at the wheels and the plastic lock for them. Despite the late age we got him at, he has proven smart and trainable, but with a good dose of the stubbornness that is typically present in the more intelligent breeds. All in all, he's worked his way into our hearts and family pretty solidly--and I have hopes that by next year, the "DestructoBeast" moniker can be dropped. For now, we'll try to endure, and retrain, his teenagerish ways. Welcome to the family, Thunder.